For other uses, see Finchley (disambiguation). Finchley (/ˈfɪntʃli/) is an area of northwest London, England, in the London Borough of Barnet. Finchley is on high ground, 11 km (6.8 mi) north of Charing Cross. 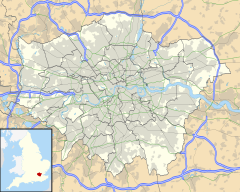 It formed an ancient parish in the county of Middlesex, becoming a municipal borough in 1933, and has been part of Greater London since 1965. It is predominantly a residential suburb, with three town centres: North Finchley, East Finchley and Finchley Church End (Finchley Central). Finchley probably means "Finch's clearing" or "finches' clearing" in late Anglo-Saxon; the name was first recorded in the early 13th century. Finchley is not recorded in Domesday Book, but by the 11th century its lands were held by the Bishop of London. In the early medieval period the area was sparsely populated woodland, whose inhabitants supplied pigs and fuel to London. Extensive cultivation began about the time of the Norman conquest. By the 15th and 16th centuries the woods on the eastern side of the parish had been cleared to form Finchley Common. The medieval Great North Road, which ran through the common, was notorious for highwaymen until the early 19th century. St Mary-at-Finchley Church is first recorded in the 1270s. Near the northern gate to the Bishop of London's park, the hamlet of East End, later East Finchley, had begun to develop by 1365. The Edgware, Highgate and London Railway (later the Great Northern Railway) reached Finchley in 1867. It ran from Finsbury Park via Finchley to Edgware. The branch from Finchley to High Barnet opened in 1872. In 1905 tram services were established in Finchley, and extended shortly afterwards to Barnet. They were eventually replaced by trolleybuses. In 1933, the Underground New Works Programme (1935–1940), to electrify the lines through Finchley, and connect the Northern line from Archway to East Finchley, via a new tunnel was announced. Much of the work was carried out and East Finchley station was rebuilt, but the project was halted by the second world war. All passenger services from Finchley to Edgware ended in September 1939. Nevertheless, Underground trains began running from central London to High Barnet in 1940, and to Mill Hill East, to reach the army barracks, in 1941. After the war, the introduction of London's Metropolitan Green Belt undermined pre-war plans and the upgrading between Mill Hill East and Edgware (the 'Northern Heights' project) was abandoned, although the line continued to be used by steam trains for goods traffic through Finchley, until 1964. From around 1547 Finchley had a parish vestry, which became a local board in 1878, an urban district council in 1895, and finally a municipal borough council between 1933–1965. The area is now part of the London Borough of Barnet. From 1959–1992 the Finchley constituency was represented in Parliament by Margaret Thatcher, UK Prime Minister from 1979–1990. Finchley is now included in the new constituency of Finchley and Golders Green. In February 2010, the Green Party held its spring party conference at the artsdepot in North Finchley. Finchley is on a plateau, 90 metres (300 ft) above sea level 11 km (6.8 mi) north of Charing Cross and 6 km (3.7 mi) south of Barnet. To the west is the Dollis valley formed by Dollis Brook the natural western boundary of Finchley. Mutton Brook forms the southern boundary, joining the Dollis Brook to become the River Brent. North Finchley, surrounding Tally-Ho corner, stretching west to the Northern line, in postcode district N12. The residential areas of West Finchley, in postcode district N3, and Woodside Park, in postcode district N12, centre on their respective tube stations to the west of the area. Between East Finchley and Finchley Central is Long Lane, which runs parallel to the tube line and is dotted with small shopping parades. The area of London known as 'Finchley Road', around Finchley Road Underground station, is not part of Finchley, but instead refers to a district further south at Swiss Cottage, Camden. The area is named after a section of the A41 road, which runs north to Golders Green and eventually continues to Henlys Corner on the North Circular Road and on to Finchley. According to the 2011 UK Census in Finchley Church End ward, 67% of the population was White (47% British, 18% Other, 2% Irish), 8% Indian and 6% Other Asian. The largest religion was Judaism, claimed by 31% of the population, whereas Christians made up 28%. West Finchley ward was 61% White (40% British, 18% Other, 3% Irish), 13% Indian and 8% Other Asian. St Mary's at Finchley is the parish church, with parts dating from the 13th century. College Farm is the last farm in Finchley; it was a model dairy farm, then a visitor attraction. The Phoenix Cinema in East Finchley with its 1930s art deco façade is one of the oldest purpose-built cinemas in the United Kingdom. The Sternberg Centre for Judaism in the old Manor House (formerly convent and school of St Mary Auxiliatrice) at 80 East End Road in Finchley is a Jewish cultural centre. It was founded to facilitate Reform and Liberal Jewish institutions,[clarification needed] attached to the Movement for Reform Judaism. The Archer, on East Finchley tube station, is a 10-foot-tall (3.0 m) statue by Eric Aumonier of a kneeling archer having just released an arrow. The statue La Délivrance depicts a naked woman holding a sword (and is informally known as the Naked Lady); it stands at the approach to Finchley from the south, in a small garden beside Regent's Park Road, just north of Henlys Corner. Transport for London is responsible for transport in Finchley. Finchley has four London Underground stations, all on the High Barnet branch of the Northern line, which serves the West End and City (financial district). East Finchley in zone three, serves East Finchley and is 21 minutes from Charing Cross. Finchley Central in zone four, serves Finchley, Church End and is 25 minutes from Charing Cross. West Finchley in zone four, serves North Finchley and is 27 minutes from Charing Cross. Woodside Park in zone four, serves North Finchley and is 29 minutes from Charing Cross. Two of London's major roads, the east-west A406 North Circular Road and the north-south A1 meet and briefly merge at Henlys Corner at the southern edge of Finchley. North Finchley bus station is a hub with nine bus routes using bus stops around Tally Ho Corner. There are 17 primary schools in the district. There are seven secondary schools. Three are voluntary aided schools, all Catholic: Bishop Douglass Catholic, Finchley Catholic High and St Michael's Catholic Grammar. Two are community schools: Christ's College Finchley and The Compton. Two are academies: The Archer Academy  and The Wren Academy, named after Sir Christopher Wren, and sponsored by the Church of England. There is also a secondary special school, Oak Lodge Special School in East Finchley. Woodhouse College in North Finchley, on the site of the old Woodhouse Grammar School, is one of two colleges in the borough. The local football teams Old Finchleians formed in 1901 who play home games at The Old Finchleians Memorial Ground in Southover and are members of the Southern Amateur League.Nicknamed The OF's the club have had well known players like Gordon Finnie,Wayne Gosling and Cliff Brooks on their books.Wingate & Finchley,plays in the premier division of the Isthmian league. The club was formed in 1991 following the merger between Finchley Football Club (est 1874) and Wingate Football Club (est 1946). Although the club is sometimes incorrectly perceived to be exclusively Jewish, it is open to people of every religion and ethnic background. Wingate & Finchley play home games at Summers Lane, N12. The rugby team is Finchley RFC. Finchley Cricket Club (founded 1832), plays in the Middlesex premier league, at Arden Field, East End Road, N3. Finchley golf club on Frith Lane was designed by five-times Open Champion James Braid. Ken Brown, Ryder Cup player and BBC presenter, described it as "The best presented golf course for club play that I have seen in years". Veolia Water Central Limited, formerly Three Valleys Water, supplies Finchley's water; the area is in the southeast corner of the company's water supply area. EDF Energy Networks is the Distribution network operator licensed to distribute electricity from the transmission grid to homes and businesses in Finchley. Finchley Memorial Hospital, on Granville Road, North Finchley, was a small NHS hospital administered by NHS Barnet, a primary care trust. Built with local donations in 1908 it was originally Finchley Cottage Hospital, renamed and expanded after the first world war as a war memorial. A new hospital on adjacent land opened in September 2012; the old hospital buildings were demolished. London Ambulance Service responds to medical emergencies in Finchley. Policing in Finchley is by the Metropolitan Police Service. Statutory emergency fire service is by London Fire Brigade, which has a station on Long Lane. The artsdepot, a community arts centre including a gallery, studio and theatre, opened in 2004, at Tally Ho Corner, North Finchley. Finchley Film Makers was founded as the Finchley Amateur Cine Society in 1930, making it one of the oldest clubs in the Country. It still meets at the Quaker Meeting House in Alexandra Grove, North Finchley. Victoria Park is off Ballards Lane between North Finchley and Finchley Central. It was proposed in 1887 to mark Queen Victoria's golden jubilee and opened in 1902 to be Finchley's first public park. It is home to tennis courts and Finchley Victoria Bowling and Croquet Club. There is also a small nature reserve adjacent to the North Circular Road, Long Lane Pasture. Avenue House in East End Road was built in 1859. In 1874 it was acquired by Henry Charles Stephens, known as "Inky" Stephens, the son of the inventor of indelible blue-black ink Dr Henry Stephens. On his death in 1918 he bequeathed the house and its grounds to "the people of Finchley". The estate is now known as Stephens House and Gardens. It has a visitor centre with a small museum, the Stephens Collection, which covers the history of the Stephens Ink Company and the history of writing materials. The bequest also included Avenue House Grounds, designed by the leading nineteenth-century landscape gardener Robert Marnock. This has a tearoom, a children's playground, a walled garden called The Bothy, a pond and rare trees. A recent attraction is a bronze statue of Spike Milligan sitting on a bench. William Hogarth painted his satirical March of the Guards to Finchley in 1750. It is a depiction of a fictional mustering of troops on London's Tottenham Court Road to march north to Finchley to defend the capital from the second Jacobite rebellion of 1745. In Charles Dickens' The Old Curiosity Shop Mr Garland, one of the principal characters, lives in "Abel Cottage, Finchley". In More Peers, a book of comic verse by Hilaire Belloc, one of the poems is about Lord Finchley. Bluebottle, a character in the 1950s BBC radio series The Goon Show, hails from East Finchley. Peter Sellers, who played Bluebottle, lived in the area at one time. In various episodes of the Channel 4 comedy Peep Show Finchley is used as an on-site shooting location. In the Disney film series The Chronicles of Narnia, the Pevensies are from Finchley, although in the original book series it is not specified which part of London they are from. The Monty Python's Flying Circus comedy sketch "The Funniest Joke in the World" is set in Finchley. In John Steinbeck's Once There Was A War a wee old English woman, discovered on the Isle of Capri is described, "She was dressed in decent and aging black. She never had made the slightest concession to Italy. Her costume would have done her honor and protected her from scandal in Finchley." Sir Thomas Allen (1603–1681), politician and lawyer, died in Finchley. Thomas Pengelly (1650–1696), wealthy merchant, gave lodging to Richard Cromwell after the Restoration at a property he owned in Finchley. Rudolph Ackermann (1764–1834), Anglo-German inventor and bookseller, died in Finchley. Henry Stephens (1796–1864), who founded the Stephens Ink company, and his son Henry Charles Stephens, who was the local MP from 1887 until 1900, lived in Finchley: Henry Charles in Avenue House which he left, in 1918, as a bequest to the people of Finchley, along with its grounds, now known as Stephens House and Gardens. Sir William Shee (1804–1868), the first Roman Catholic judge to sit in England and Wales since the Reformation, lived in Finchley. The novelist Charles Dickens (1812–1870) wrote Martin Chuzzlewit while staying at Cobley Farm near Bow Lane, North Finchley. Owen Suffolk (born 1829), Australian poet, autobiographer and confidence trickster, was born in Finchley. Octavia Hill (1838–1912), a social reformer and a founder of the National Trust, Kyrle Society and the Army Cadet movement lived at Brownswell Cottages on the High Road in East Finchley just south of the junction with the North Circular Road today. L. S. Bevington (1845–1895), anarchist poet, essayist and journalist, died and was buried in Finchley. Dora Boothby (1881–1970), Wimbledon-champion tennis player, was born in Finchley. Private John Parr (1897–1914), the first British soldier and the first soldier of the Commonwealth killed in World War I, was born in Church End Finchley, and lived at 52 Lodge Lane, North Finchley. Harry Beck (1902–1974), an engineering draftsman who created the present London Underground Tube map in 1931, lived in Finchey. There is a plaque commemorating him along with a copy of his original map on the southbound platform at Finchley Central tube station. Terry-Thomas (1911–1990), comedian and actor, was born in Finchley. Wing Commander Ian Richard Gleed DSO DFC (1916–1943), World War II flying ace later revealed to have been gay, was born in Finchley. Spike Milligan (1918–2002), the comedian who was chief creator and main writer of The Goon Show, lived in Woodside Park from 1955 to 1974. He was president and patron of the Finchley Society. His statue, sitting on a bench, occupies a prominent position at Stephens House and Gardens. Margaret Thatcher (1925–2013), UK Prime Minister 1979–1990, was Conservative MP for Finchley from 1959 to 1992, although she lived in Chelsea before her time in Downing Street. Peter Cleall (born 1944), actor and actors' agent, was born in Finchley. John Zarnecki (born 1949), space scientist, was born in Finchley. Jonathan Sacks (Lord Sacks) (born 1948), former Chief Rabbi, grew up in Finchley. Tim Parks (born 1954), writer, grew up in Finchley. Emma Bunton (born 1976), a singer, member of the Spice Girls, was born in Finchley. George Michael (1963–2016), the singer, was born in East Finchley. Ram Vaswani (born c. 1970), professional snooker and then poker player, lives in Finchley. Finchley Borough had four twin towns; the London Borough of Barnet continues these links. The Finchley Gap, a geographical feature describing a corridor of low-lying land between the drainage basin of the River Colne to the north and the River Brent to the west and possibly the remains of an Ice age overflow channel. ^ a b c d Baker & Elrington (1980). "A History of the County of Middlesex: Volume 6". Victoria County History. pp. 38–55. Retrieved 27 April 2009. ^ a b "Finchley, Friern Barnet and Totteridge". London Borough of Barnet. Retrieved 10 March 2016. ^ "Hendon Lane (Finchley N3)". London Borough of Barnet. Retrieved 10 March 2016. ^ a b Weinreb, Ben; Christopher Hibbert. The London Encyclopedia. Julia Keay, John Keay (3rd ed.). Macmillan. pp. 290–291. ISBN 978-1-4050-4924-5. ^ Nurse, Richard (13 February 2008). "Finchley N2 East End Road". LB Barnet. Retrieved 23 September 2009. ^ Baker, T F T; C R Elrington (1980). "Finchley Finchley Local government". British History Online. Retrieved 21 September 2009. ^ a b "Historic Figures Margaret Thatcher (1925 - )". BBC. Retrieved 27 April 2009. ^ Lowe, Rebecca (21 February 2010). "Green Party conference held in Finchley". The Times Series. Retrieved 6 March 2010. ^ "Buses from North Finchley" (PDF). Transport for London. Retrieved 22 September 2009. ^ a b Crouch, Suzanne (10 September 2009). "Schools and Colleges". LB Barnet. Archived from the original on 1 October 2009. Retrieved 24 September 2009. ^ "why wren academy". Wren Academy. 2009. Retrieved 25 September 2009. ^ Lowe, Rebecca (10 December 2007). "Barnet cricket – 150 and not out". Times Series. Retrieved 24 September 2009. ^ "Our supply area". Veolia Water. Archived from the original on 9 August 2011. Retrieved 1 October 2009. ^ "Honouring a century of care at Finchley Memorial Hospital". Times Series. 21 October 2008. Retrieved 1 October 2009. ^ "The history of Avenue House Estate". Avenue House Estate. 2008. Retrieved 29 March 2012. ^ Nurse, Richard (13 February 2008). "Finchley N12 Fallow Corner". LB Barnet. Retrieved 28 April 2009. ^ "Early Social Reform Influences". Octavia Hill's Birthplace House. Retrieved 28 April 2009. ^ "The Octavia Hill Society" (PDF). The Finchley Society. September 2009. Archived from the original (PDF) on 16 July 2011. Retrieved 1 October 2009. ^ "Bevington, Louisa Sarah, 1845–1895" Retrieved 28 April 2015. ^ "Design Classics-The London Underground Map". BBC TV4. ^ "Spike Milligan Statue Fund". Finchley Society. Archived from the original on 26 March 2009. Retrieved 28 April 2009. ^ Godleman, Mike (4 July 2007). "Town twinning Jinja (Uganda)". LB Barnet. Retrieved 28 April 2009. ^ Costello, Laura (28 July 2008). "Town twinning Le Raincy (France)". LB Barnet. Retrieved 28 April 2009. ^ Costello, Laura (29 July 2008). "Town twinning Montclair (USA)". LB Barnet. Retrieved 28 April 2009. ^ Godleman, Mike (28 July 2008). "Town twinning Siegen Wittgenstein (Germany)". LB Barnet. Retrieved 28 April 2009. Wikimedia Commons has media related to Finchley. "Finchley" . Encyclopædia Britannica (11th ed.). 1911.